The minute the bell rings at the end of a long school day, children come racing into the gym. Amid violins, violas, cellos, and basses, the students chatter and have their snack. “YA-MA OR-chestra!” calls out founding director Stephanie Hsu ’08, and the kids respond rhythmically in kind, “YA-MA OR-chestra!” The room is suddenly silent, the students at attention. This ritual call to action marks the beginning of the third-through-sixth-graders’ afterschool program, Yakima Music en Acción, or YAMA, a string orchestra at Garfield Elementary School in central Washington state. 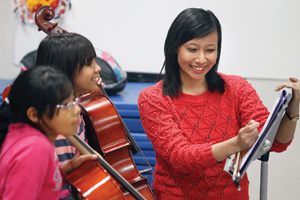 For two hours every weekday, the students have lessons, play musical games, sing, and learn classical and popular music with the full orchestra. YAMA is modeled on the wildly successful Venezuelan El Sistema social program for children’s orchestras. Hsu describes this virtually free music education as a “metaphor” for encouraging at-risk children to develop valuable life skills. Located in a stressful neighborhood, Garfield experiences frequent lockdowns due to nearby shootings. Hsu feels fortunate she was able to organize an extremely supportive partnership between the local public school district, the Yakima Symphony Orchestra (both of which supply committed teachers), and the OIC (Opportunities Industrialization Center) of Washington. 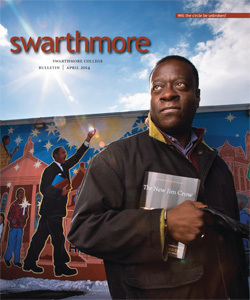 Hsu feels that this constant drive to improve was the predominant culture at Swarthmore. She declares, “It is inspiring to see just how natural that is for children” at YAMA as well. The students are always looking ahead, hoping to become leaders in their instrument sections or better teachers to new students—or practicing for the next monthly concert. The children take great pride in their well-rehearsed shows under multiple conductors, including themselves, and after one full year of operation, Hsu now often sits unobtrusively in the back of the orchestra. The audience, she says, “goes nuts” at the conclusion of each performance. The children’s concentration has become so sharp, Hsu comments, that one of their best rehearsals successfully competed with a noisy basketball practice in the gym. The forward momentum is also reflected in the program’s continual expansion, with the numbers now fourfold what they were a year ago. Already an accomplished violinist and violist when she arrived at Swarthmore, Hsu enjoyed playing in a serious chamber music ensemble throughout college but majored in educational studies and sociology and anthropology. Using music to promote social justice was an evolving concept for her at Swarthmore. It wasn’t until she saw a 60 Minutes show about El Sistema after graduation that she had her Eureka moment: “Oh my goodness, this is it!” Hsu then attended New England Conservatory as an El Sistema fellow in a course designed to teach that program’s methods in both Boston and Venezuela. Hsu is fervently committed to the future of YAMA. “I love what I do,” she says passionately. Her office contents betray the magnitude of her behind-the-scenes efforts: a few spare violins and cellos, time sheets, media releases, legal agreements—the voluminous paperwork necessary to support a nonprofit. As the YAMA day draws to a close, the parents filter in to pick up their children and observe the final minutes of the program. Each session concludes with a variety of singing, including Beethoven’s “Ode to Joy”—in Spanish, “Himno de la Alegria.” The parents always applaud enthusiastically.